Students will learn about the formation of caverns, both in Florida and along the East Coast. Students will also be able to identify parts of a cave and their significance in our ecosystem. Students will research the Florida Caverns and create a videolog pretending to be settlers or Native Americans who needed to use the caverns. Students will describe the exterior and interior and why they chose the cave versus another safe area. 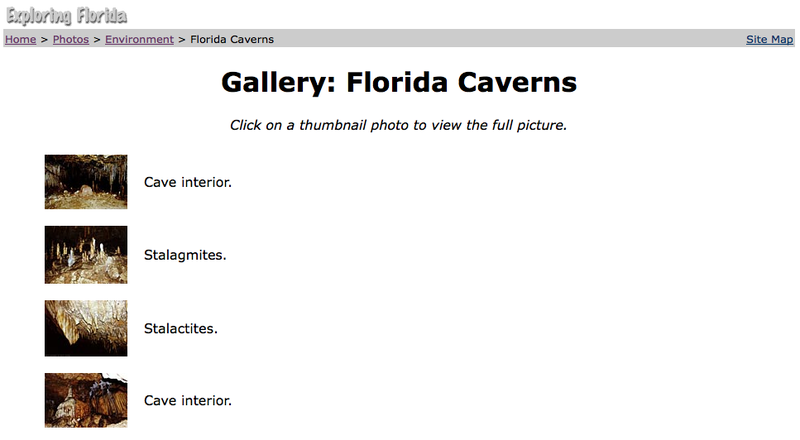 Alternatively, students could research the Florida Caverns and their significance to Florida and present-day sinkholes. This information can be compiled in a number of ways - a PowerPoint presentation, a group paper where the students collaborate using Google Docs, an interactive web site, etc.